Apple's stock climb led a broad rise across the S&P 500 information technology sector, which was up 2.5 percent on Thursday. Apple "drives a lot of suppliers in the tech space," Marc Chaikin, CEO of Chaikin Analytics, told CNBC. Shares of Apple also surpassed a key technical level on Thursday, its 200-day moving average, which is sometimes used to determine long-term trends. Tim Cook, CEO of Apple laughs while Lana Del Rey (with iPad) takes a photo during a launch event at the Brooklyn Academy of Music on October 30, 2018 in New York City. The technology giant's stock climb led a broad rise across the S&P 500 information technology sector, which was up 2.5 percent on Thursday. That sector has climbed 20 percent this quarter. Apple shares recently passed the "really critical" level of $185 last week, Marc Chaikin, CEO of Chaikin Analytics, told CNBC. "Surpassing that peak from November 30 that was really important," Chaikin said. Chaikin pointed to Apple's "synergistic" relationship with chip suppliers, such as Micron Technology. Apple's stock "drives a lot of suppliers in the tech space," Chaikin said. "I think Micron's earnings give some substance to the Apple story," Chaikin said. Additionally, reports that Apple plans to keep as much as 50 percent of subscription revenues from its coming online streaming service, as well as growing confidence in Apple's new product line up, are helping drive the stock higher, Chaikin thinks. "There's a lot of betting going on that Apple can make the transition from a hardware company to software and streaming service," Chaikin said. Shares of Apple also surpassed a key technical level on Thursday, its 200-day moving average. 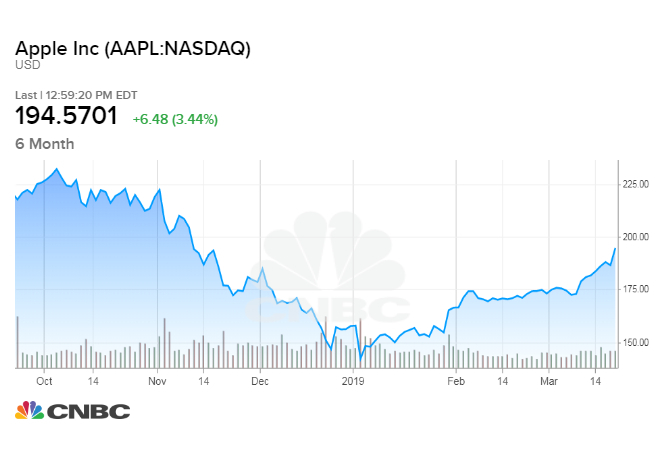 The metric helps indicate to investors the overall long-term trend of a stock and, in this case, shows how Apple's stock has been steadily climbing. While Chaikin said the 200-day moving average is more closely watched for indexes, rather than for individual stocks like Apple, he did note that the metric has "symbolic" importance. 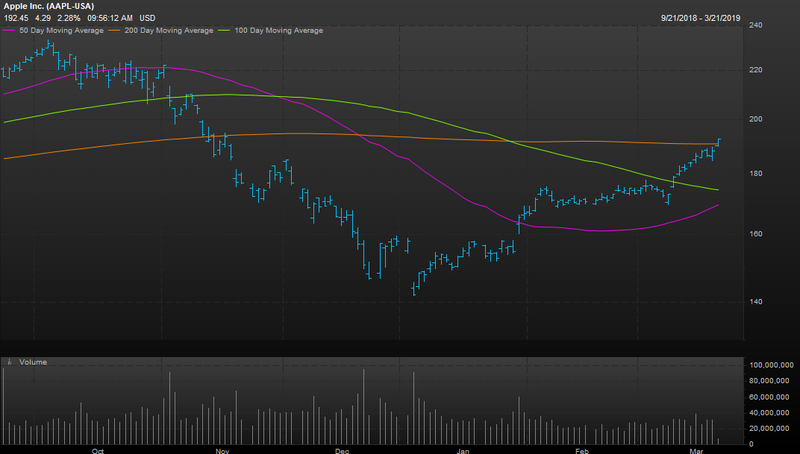 This was the first time Apple shares surpassed the 200-day moving average since Nov. 16 on an intraday trading basis. Apple's stock is up more than 23 percent this quarter, on pace for its best quarter of trading since the first quarter of 2017. Additionally, Apple has gained roughly $178 billion in market value since the start of 2019. The 200-day moving average is often used by technical analysts to determine a change in long term trend. 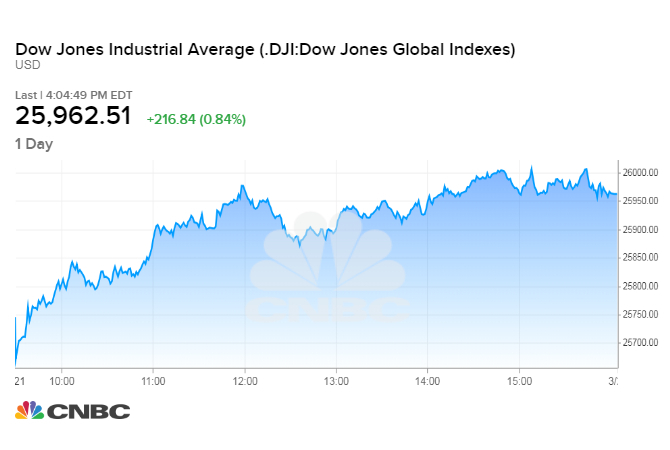 Apple also led the Dow Jones industrial average on Thursday, contributing 47 points to the Dow's 216 point climb. Apple is expected to unveil a new streaming TV service at an event on March 25. Needham also upgraded its rating on Apple shares to strong buy from buy on Thursday, saying Apple's ecosystem has "value upside." – CNBC's Gina Francolla and J.R. Reed contributed to this report.